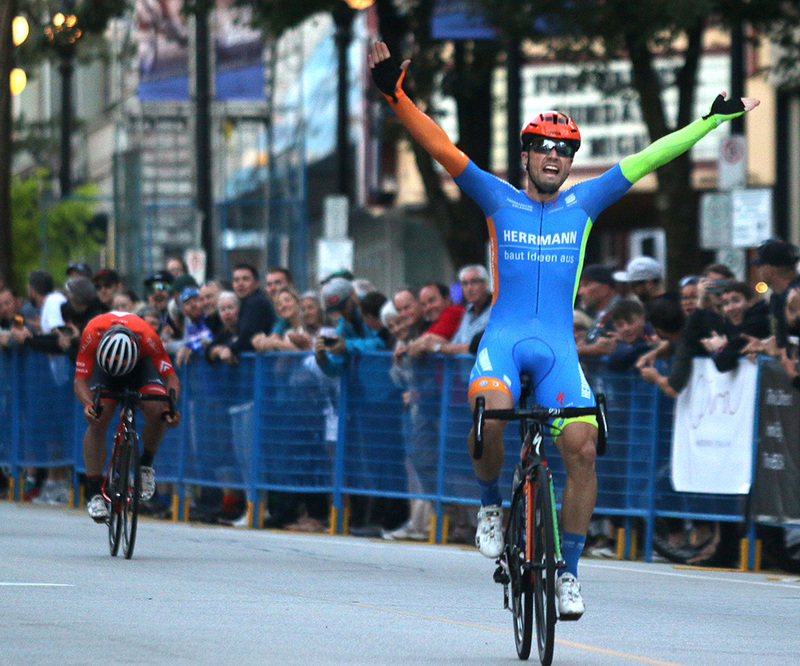 It took some veteran savvy, but Florenz Knauer defended his title as New West Grand Prix champion on Tuesday night at the second edition of BC Superweek’s newest race. Knauer, who’s from Germany but lives in Delta, BC, was inconspicuous throughout the race, but it turns out that was exactly what he had planned. It was the same strategy that helped him win the race a year ago. "I did the same tactic – exactly the same as last year - I sat on the whole race, I didn't make any moves and I gambled that no group would go away. And then on the last lap, I think I was 30th position, I got a little bit caught and then on my turn up the hill, I hit it to catch up to the kid." "The kid” Knauer is referring to is 19-year-old Edward Walsh, riding for T-Palm TCW. With three laps to go, the Halifax, Nova Scotia native broke away from the peloton to win the crowd prime and had a six second lead with one lap to go. Many in the crowd thought he would bring it home, but on the last lap Walsh was overtaken by the pack and wound up finishing 17th. Knauer stole the show at last year’s New West Grand Prix by proposing to his girlfriend – now fiancé Alisha – on stage after winning the race, but he told the crowd on Tuesday that he didn’t have any other surprises planned. "Not this year, sorry!” he smiled. The 29-year-old certainly isn’t surprising anyone with his performance on the bike – the win is his third podium appearance at BC Superweek this year. 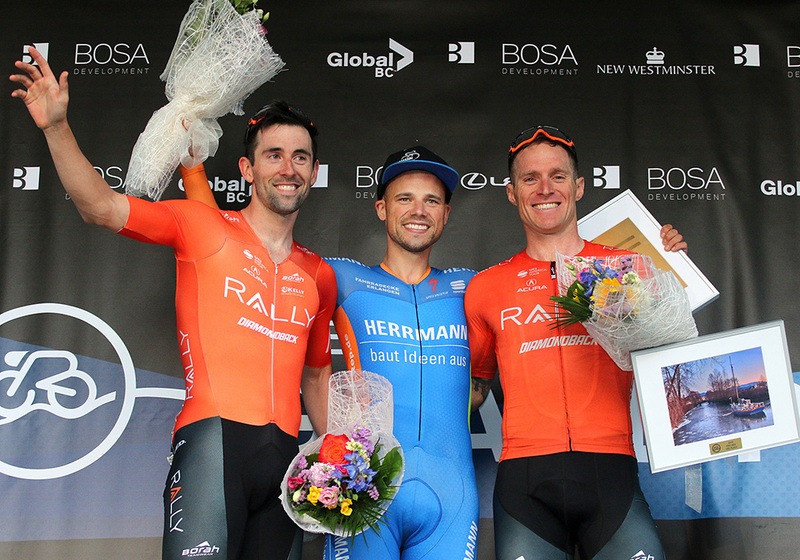 Rally Cycling’s dominance at BC Superweek continued despite the fact the men’s team consists of just two riders – Eric Young, who came second, and Brad Huff, who came third. The New West Grand Prix is the fourth straight podium appearance for the 29-year-old Young after he was first in Friday’s North Delta Criterium and Saturday’s Ladner Criterium, along with a third-place finish in Sunday’s White Spot Road Race. Huff, 39, has been on three of four podiums at BC Superweek this year after he came third in North Delta and second in Ladner. "I'm just like an old horse that's been put out to pasture that doesn't know he's been put out there. I just keep digging, keep fighting,” the resident of Cortez, Colorado said. "Florenz is amazing. He's won virtually everything at BC Superweek over the years and is just a fierce competitor. He's very calculated and took the race, my hat is off to him." As for Knauer’s tactic of sitting back and then going for it on the final lap, Huff says they expected it, but just couldn’t combat the speed on the first corner from Columbia onto Eighth and the hill up Carnarvon to Sixth. "Florenz is that fast, he was setting up at the bottom of the first corner, I could see him doing it and I just couldn't follow him,” he said. "Eric did his best and got a close second, but Florenz just went bottom to top, like he did last year. You know it's coming, but you just can't follow it." Just like every other rider registered to race BC Superweek, Knauer is especially looking forward to Wednesday’s Global Relay Gastown Grand Prix. Vancouver’s Sara Bergen hated to miss the beginning of BC Superweek. Her reason for not taking the starting line at the Tour de Delta this past Friday, Saturday and Sunday was no different than why anyone else doesn’t make it to work – she was flat out sick. Bergen, who rides for Rally Cycling, certainly made up for lost time as she was part of a break of three that caught the field on the final lap at the New West Grand Prix and sprinted for first place. "I am so disappointed to miss those first three races - hometown races, I'd love to catch it all. But you've got to listen to your body and my body said take a lot of naps and eat a lot of cake, so that's what I did - pancakes, ice cream - all the nutritious food for sure!” Bergen laughed post-race. "I'm so stoked to be back, this race is definitely one of my favourites, it's such a fun course, great audience, such a great week. I'm so excited to be back and this is the first day in the maple leaf jersey, so glad I could represent!" 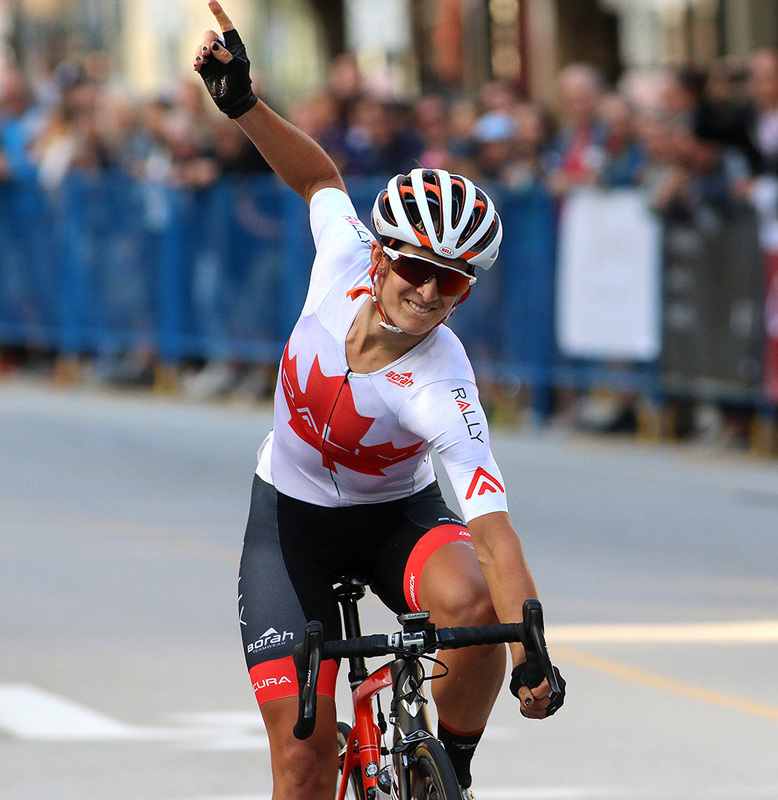 It was just two weeks ago that Bergen won her first Canadian national criterium title in Saguenay, Quebec, so BC Superweek is the first opportunity for fans to see her wearing the red and white as national champion. 2017 New West Grand Prix champion - and Bergen’s teammate on the Rally team - Kirsti Lay was also a steady threat throughout the 40-lap, 38 kilometre race. "We had five really strong teammates out there today, so we definitely played off each other and let the course do a bit of the work for us,” explained Bergen. "The first kicker really puts some pressure on everyone's legs and I felt it was good to let the course do that work and then play off our teammates and really animate the back half and never let up. We definitely got the pressure on and put the pedal down." Kendall Ryan saw her BC Superweek three race winning streak come to an end, but a teammate of hers from the TIBCO-Silicon Valley Bank squad did make it onto the podium, with Shannon Malseed of Mount Clear, Australia coming in second just behind Bergen. Ryan looks to repeat as champion at the Globay Relay Gastown Grand Prix on Wednesday. With a $12,000 prize purse as North America’s richest criterium and close to 30,000 fans expected to attend, Bergen is champing at the bit to take to the course in Gastown as well. "It's always on my list, it's a huge favourite - I can't say enough. I live in Downtown Vancouver and raced it the last four years. With Rally Cycling coming in second and third last year so we're excited for tomorrow, it's gonna be a hell of a race." Local riders wound up taking two of three spots on the podium in New Westminster on Tuesday. In addition to Bergen winning the race, Vancouver’s Haley Gill from Rise Racing came third ahead of Vermillion, Alberta’s Alison Jackson (Team TIBCO-Silicon Valley Bank) and Lay, who were fourth and fifth respectively. 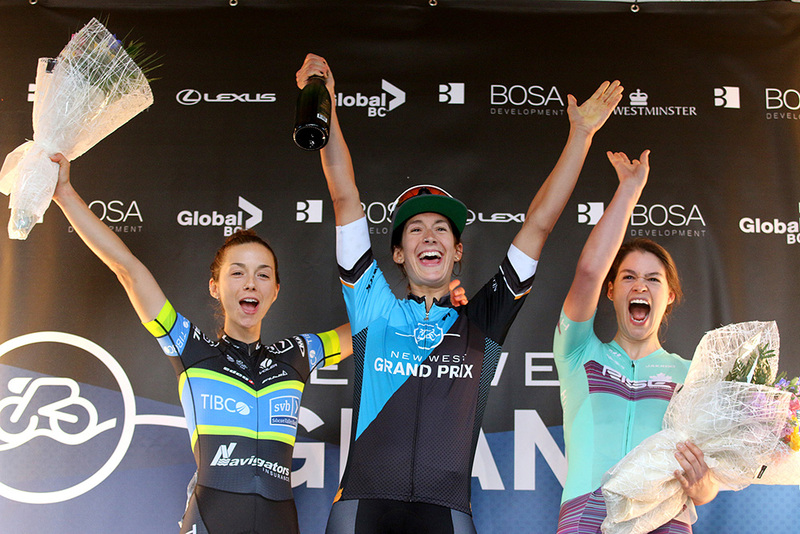 BC Superweek continues Wednesday with the Global Relay Gastown Grand Prix. The women’s race starts at 6:15 pm and the men begin at 7:30 pm. 6 Raphaele Lemieux (Can) LA Sweat both s.t. 27 Olivia Baril (Can) Macogep-Argon18-Girondins de Bordeaux p/b Mazda all s.t. 33 Joanie Caron (Can) Fluevog's Crit Nasty all s.t. 32 Stephen Keeping (Can) Probaclac/Devinci all s.t. 38 Jackson Bocksnick (Can) Hewdog Racing all s.t. 42 Nicolas Cote (Can) Velo iBike all s.t. 50 Jean-Denis Thibault (Can) H&R Block Pro Cycling Team all s.t. 59 Lewis Whiley (USA) Hedrick Racing all s.t. 63 Nicholas Perhala (USA) Monster Media Racing all s.t. 65 Ryan Roth (Can) Silber Pro Cycling s.t.